Every Sunday I take the time to mix a mask and apply it to my skin. Such a simple act feels like resetting a switch and is a big part of my skincare routine. 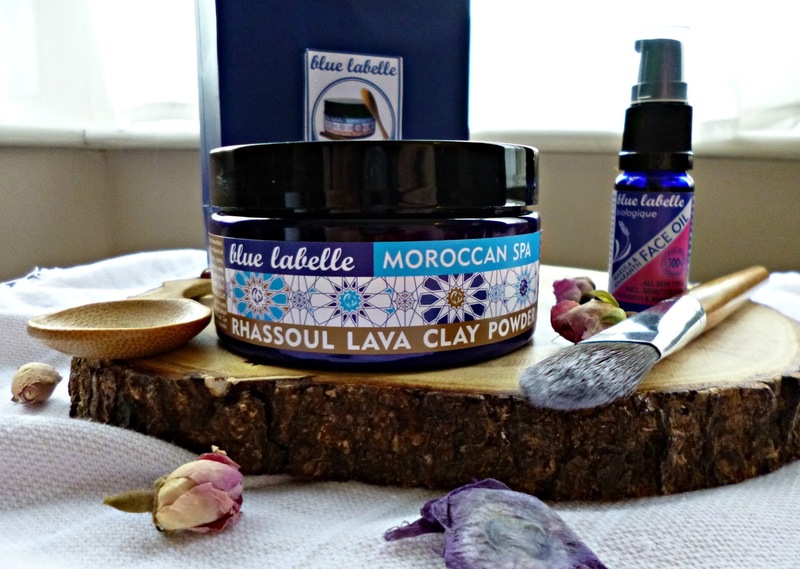 This Moroccan clay gift set from Blue Labelle is perfect for this Sunday ritual. I have mentioned Blue Labelle a few times before and it is a wonderful brand, every product is vegan and 100% natural and many are also organic, I am a big fan of the Biologique range as I think it offers fabulous value for money. Blue Labelle is also a very affordable brand, I can’t stress enough how important it is that there are green beauty brands out there catering for all price points and in this case doing it extremely well. The Moroccan clay gift set includes the fantastic Rhassoul clay powder, it is a big pot, enough for forty applications no less but can also be used on the body and hair too. Rhassoul is a gentle but effective clay, perfect for all skin types, it has a high mineral content and can absorb impurities. You also receive a handy spoon for measuring the clay, this is really useful as it means you make the right amount each time. My favourite part of the set aside from the fabulous clay is the vegan mask brush. This brush has wonderfully soft bristles and is the perfect size to make applying any mask a breeze, it also is very easy to clean, which is a bonus as I have noticed that other mask brushes can get very clogged with clay and after a while I have to throw them away. Mixing the mask couldn’t be easier, measure out the Rhassoul with your spoon and then add water or a floral water such as rose to create a paste. I measure the liquid by eye but you will need about one and half to two times liquid to clay as a guide. If you want to you can also add a small amount of oil to boost the mask further and I add a few drops of the Marula and Amaranth Facial oil which is perfect for all skins including sensitive. I find the oil really helps to stop the clay from drying too quickly on the skin. I remove the mask before it has a chance to set, if you let it dry too hard it can feel a little too harsh on the skin (that goes for all clay!) but done this way it leaves skin really soft and glowing thanks to the increase in blood flow and it also shrinks blemishes after just one application making it great for the upcoming party season. This is such a lovely little set and I highly recommend you take a look at some of the other gift options available from Blue Labelle. Perfect for presents or as a treat to self. The products are high quality, beautifully packaged and truly effective, perfect for any green beauty. Have you tried Blue Labelle? Are you a fan of Rhassoul clay?